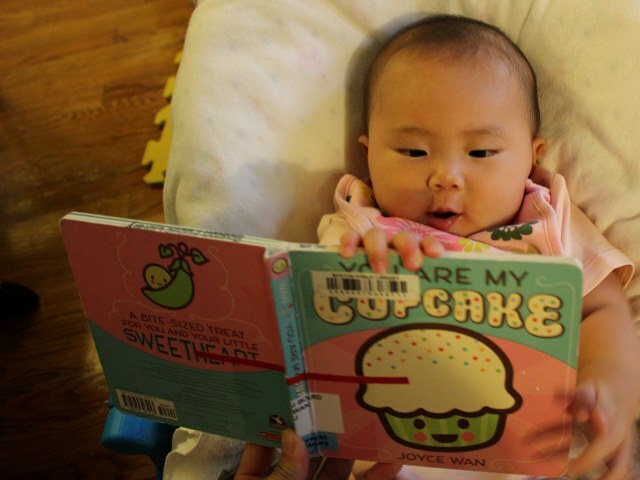 You Are My Cupcake by Joyce Wan is the cutest children’s book I have read to my little girl. The front cover shows a green cupcake with a white topping and sprinkles against a pink and blue background. The rest of the book is equally cute and my baby loved looking at all of the yummy pages. You Are My Cupcake is filled with a combination of baked goods and pet names. Foods and names consist of cupcake, gumdrop, sweet pea, cutie pie, peanut, and pumpkin. Although some of the terms of endearment would be cheesy if used between adults, all of them sound sweet when directed at young children. Text is limited to just a single sweet phrase on each pair of pages. With no more than five words on every pair of pages, even the youngest readers will be able to read the book themselves. But given the obvious opportunity for parents to show affection to their children, You Are My Cupcake is meant for adults to read to little ones. Wan’s pictures are cute despite being simple. Each food item has eyes, a noise, rosy cheeks, and a smiling mouth. Despite the fake faces, all of the desserts will be easily recognizable to even the smallest toddlers. Contrasting colors between the foods and the backgrounds create visual appeal for young babies. Arya liked looking at all the pictures. She kept slapping at the images for longer than it took me to read each page. You Are My Cupcake is appropriate for kids of all ages since it allows parents to give extra love to their children while reading the book. At just 14 pages, the entire book will take less than three minutes to read. You Are My Cupcake costs (including shipping) under $7 new and under $5 used from Amazon.